When you press the shutter button halfway, the current f-stop, shutter speed, and ISO speed appear in the viewfinder display on your Rebel T6. This is where you will monitor your exposure settings. The shutter speed, f-stop, and ISO speed appear in the viewfinder. Or if you’re looking at the Shooting Settings or Live View display, the settings appear. You also can view the settings in the Shooting Settings display (left) and Live View display (right). In the viewfinder and on the monitor in Live View mode, shutter speeds are presented as whole numbers, even if the shutter speed is set to a fraction of a second. For example, for a shutter speed of 1/50 second, you see just the number 50 in the display, as shown in the Live View example. When the shutter speed slows to 1 second or more, you see quotation marks after the number — 1” indicates a shutter speed of 1 second, 4” means 4 seconds, and so on. It’s easy to mix up the two values in the two displays that don’t include the letter F to indicate the aperture setting. For example, a casual glance at the values shown at the bottom might lead you to think that both are set to 50. In fact, there’s a tiny period between the second 5 and 0 (for f/5.0). But if your close-up eyesight is like mine, well . . . just remember that the f-stop always appears to the right of the shutter speed, whether you’re checking settings in the viewfinder, the Shooting Settings screen, or Live View screen. 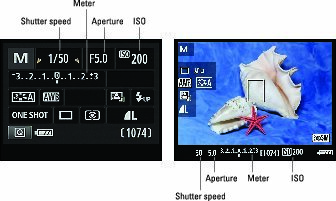 The viewfinder, Shooting Settings display, and Live View display also offer an exposure meter. This graphic appears slightly different in the viewfinder than in the other two displays. Because of the limited display area, the viewfinder meter shows an exposure range of –2 to +2, while the other two displays go from –3 to +3. While the numbers on the meter represent whole stops, the bars in-between represent exposure changes of one-third of a stop. If you prefer, you can tweak the meter so that any exposure changes occur in half-stop increments. In M (manual) exposure mode, the meter indicates whether your settings will properly expose the image. When the exposure indicator (the bar under the meter) aligns with the center point of the meter, as shown in the middle example, the current settings will produce a proper exposure. If the indicator moves to the left of center, toward the minus side of the scale, as in the left example, the camera is alerting you that the image will be underexposed. If the indicator moves to the right of center, as in the right example, the image will be overexposed. The farther the indicator moves toward the plus or minus sign, the greater the potential exposure problem. In manual exposure (M) mode, the meter indicates whether exposure settings are on target. 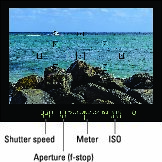 In the other exposure modes (P, Tv, and Av), the meter displays the current Exposure Compensation setting. Remember, in these exposure modes, the camera sets the shutter speed, aperture, or both, to produce a good exposure. Because you don’t need the meter to tell you whether exposure is okay, the meter instead indicates whether you enabled Exposure Compensation, a feature that forces a brighter or darker exposure than the camera thinks is appropriate. When the exposure indicator is at 0, no compensation is being applied. If the indicator is to the right of 0, you applied compensation to produce a brighter image; when the indicator is to the left, you asked for a darker photo. Av mode (aperture-priority autoexposure): The shutter speed value blinks to let you know that the camera can’t select a shutter speed that will produce a good exposure at the aperture you selected. Choose a different f-stop or adjust the ISO. Tv mode (shutter-priority autoexposure): The aperture value blinks to tell you that the camera can’t open or stop down the aperture enough to expose the image at your selected shutter speed. Your options are to change the shutter speed or ISO. P mode (programmed autoexposure): In P mode, both the aperture and shutter speed values blink if the camera can’t select a combination that will properly expose the image. Your only recourse is to either adjust the lighting or change the ISO setting. No matter what the exposure mode, the camera bases its exposure analysis on the metering mode, explained next.